"Caitlin" was commissioned as a family gift. The rendering was completed using a series of photos supplied by the client. This study in pen and ink techniques was completed in April 2008. 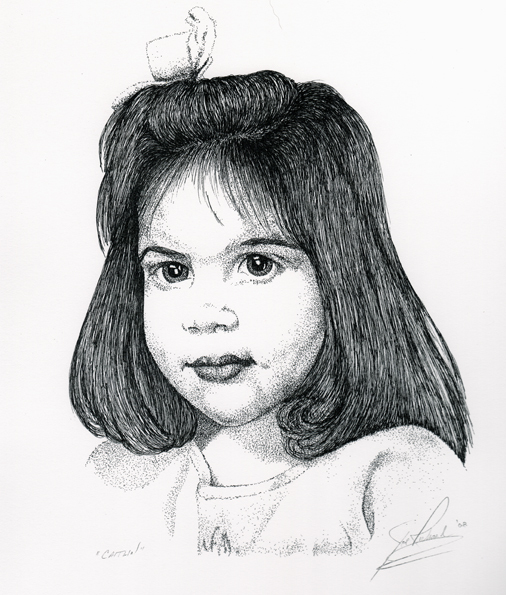 Extensive use of stippling effects combined with some line art was used to create a dramatic finished portrait of "Caitlin". The work took approximately 7 hours to complete and measures about 8 1/2 x 11 inches on an 11 x 14 background.